↑ 1.0 1.1 1.2 1.3 1.4 "Rickets". Genetic and Rare Diseases Information Center (GARD) – an NCATS Program (in ਅੰਗਰੇਜ਼ੀ). 2013. Retrieved 19 December 2017. ↑ 3.0 3.1 3.2 Creo, AL; Thacher, TD; Pettifor, JM; Strand, MA; Fischer, PR (May 2017). "Nutritional rickets around the world: an update.". Paediatrics and international child health. 37 (2): 84–98. PMID 27922335. doi:10.1080/20469047.2016.1248170. 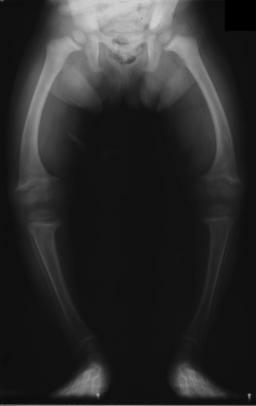 ↑ 4.0 4.1 "Rickets - OrthoInfo - AAOS". September 2010. Retrieved 19 December 2017. ↑ Florin, Todd; MD, Stephen Ludwig; Aronson, Paul L.; Werner, Heidi C. (2011). Netter's Pediatrics E-Book (in ਅੰਗਰੇਜ਼ੀ). Elsevier Health Sciences. p. 430. ISBN 1455710644. ↑ Harvey, Nicholas C.; Holroyd, Christopher; Ntani, Georgia; Javaid, Kassim; Cooper, Philip; Moon, Rebecca; Cole, Zoe; Tinati, Tannaze; Godfrey, Keith (2014). "Vitamin D supplementation in pregnancy: a systematic review". Health Technology Assessment (Winchester, England). 18 (45): 1–190. ISSN 2046-4924. doi:10.3310/hta18450. ↑ Prentice, Ann (July 2013). "Nutritional rickets around the world". The Journal of Steroid Biochemistry and Molecular Biology. 136: 201–206. PMID 23220549. doi:10.1016/j.jsbmb.2012.11.018.